Ruggieri Financial Group, "We are here to serve you"
Where Will Your Retirement Money Come From? One survey found 22% of baby boomers have found it difficult to pay mortgages or rent and have postponed plans to retire. Traditional IRAs have been around since 1974. Contributions you make to a traditional IRA may be fully or partially deductible, depending on your individual circumstances. Distributions from a traditional IRA are taxed as ordinary income and, if taken before age 59½, may be subject to a 10% federal income tax penalty. Generally, once you reach age 70½, you must begin taking required minimum distributions. Roth IRAs were created in 1997. Roth IRA contributions cannot be made by taxpayers with high incomes. To qualify for the tax-free and penalty-free withdrawal of earnings, Roth IRA distributions must meet a five-year holding requirement and occur after age 59½. Tax-free and penalty-free withdrawal also can be taken under certain other circumstances, such as a result of the owner’s death. The original Roth IRA owner is not required to take minimum annual withdrawals. Many workers are eligible to participate in a defined–contribution plan such as a 401(k), 403(b), or 457 plan. Eligible workers can set aside a portion of their pre-tax income into an account, which then accumulates tax deferred. Distributions from defined contribution plans are taxed as ordinary income and, if taken before age 59½, may be subject to a 10% federal income tax penalty. Generally, once you reach age 70½, you must begin taking required minimum distributions. Defined benefit plans are “traditional” pensions—employer–sponsored plans under which benefits, rather than contributions, are defined. Benefits are normally based on factors such as salary history and duration of employment. The number of traditional pension plans has dropped dramatically during the past 30 years. 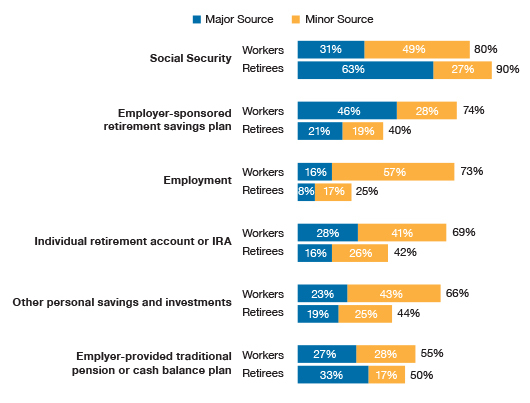 What workers anticipate in terms of retirement income sources may differ considerably from what retirees actually experience. When should you take your Social Security benefit? Here's a look at several birthdays and “half-birthdays” that have implications regarding your retirement income.